I suppose Green Room isn't too dissimilar to Don't Breathe. Both are films about a group of young people trying to escape some of kind of small building before they can be killed. While Green Room may never hit the delirious heights of Don't Breathe, it's a brilliantly effective film nonetheless. A lot of this comes down to Jeremy Saulnier's terrific direction. He demonstrated his ability to craft violence in a spectacular way with the closing act of his equally terrific Blue Ruin back in 2013, but here he escalates that to horrific new extremes. Green Room has a real knack for finding new ways to make violence and bloodshed work, and none of this is depicted better than in what happens to Pat's hand in the film's first gruesome shock. Most films would just take Pat's hand clean off. He sticks his arm through the door to slide the gun across to the guys outside, but they start hacking at him. 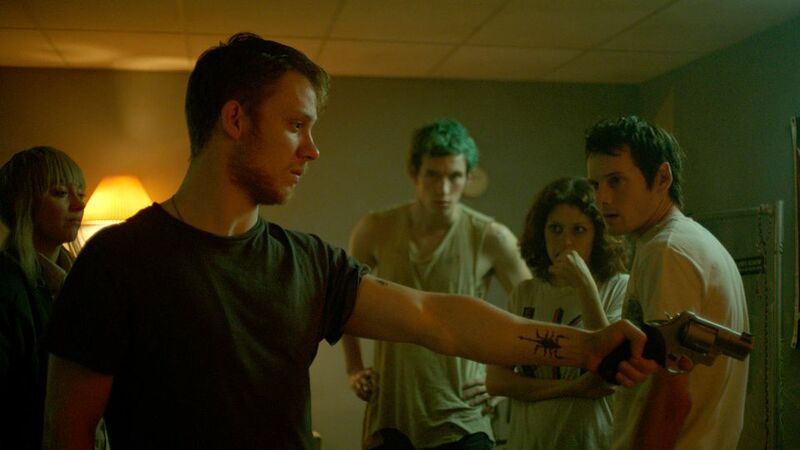 Green Room, in a brilliantly nasty little twist, refuses to go the whole way and finds something much more horrific: his hand stays attached, but only by a thread. Rather than feeling like one nasty shock which is then wrapped up and covered, it keeps coming back to make you squirm all over again. Green Room is relentless in its intensity, finding new ways to escalate everything further. It's also gorgeously shot and consistently well performed, packed with small developments that keep things moving without distracting from the film's main premise. The whole thing is mad and twisted and violent, but incredibly compact and focused. It's completely impossible to predict where it will head because you're too busy being swept up in everything that's happening at any given moment. Put me on Saulnier's fan club list. To Summarise: With gleeful unpredictability, superb directing, and a heavy dose of tension, Green Room masterfully adapts a simple premise into something surprisingly effective. Following on from the critically acclaimed Boyhood, which happens to be one of my all-time favourites, Richard Linklater returns with Everybody Wants Some, whose title comes with two exclamation points. Everybody Wants Some is a film all about living in the moment. It doesn't concern itself with the past, hardly any characters have any back stories and it's incredibly rare that any character mentions something that has happened prior to where the film begins. It also isn't particularly bothered by the future, as it signifies the start of each new day by telling us simply how long it is until class starts for the College student ensemble, and then ending at precisely the minute it does. It's all about the present, doing what you want in the exact moment you want to do it. Jake even brings up the fact that the guys hop from bar to bar without any real style, debating whether or not it feels phony. Not phony, he ultimately decides, but adaptive. In every given moment, they are who they are. Everybody Wants Some feels similar to Boyhood in that not a whole lot happens in terms of plot. It's simply a slice of life, represented as is. While Boyhood had a twelve year canvas to play with, though, Everybody Wants Some only has a few days, which means it pretty much avoids every dramatic obstacle it can. There are few arguments, Jake's eventual connection with his girlfriend goes untroubled, everyone remains friends by the end of it. Hanging out with a bunch of 1980s male college guys for two hours sounds like a bit of challenge, but Linklater frames them all in a loving way. His film feels nostalgic but never sickly, loving but never obsessive. The characters are all immensely likable, and hanging out with them moves from wary to pleasing. This is a love letter to the past from the future that's all about living in the present. It might sound convoluted, but it couldn't be further from it. Linklater has struck gold once again. He has a unique way of depicting life in a magical and inspiring way, even without really showing much of it. 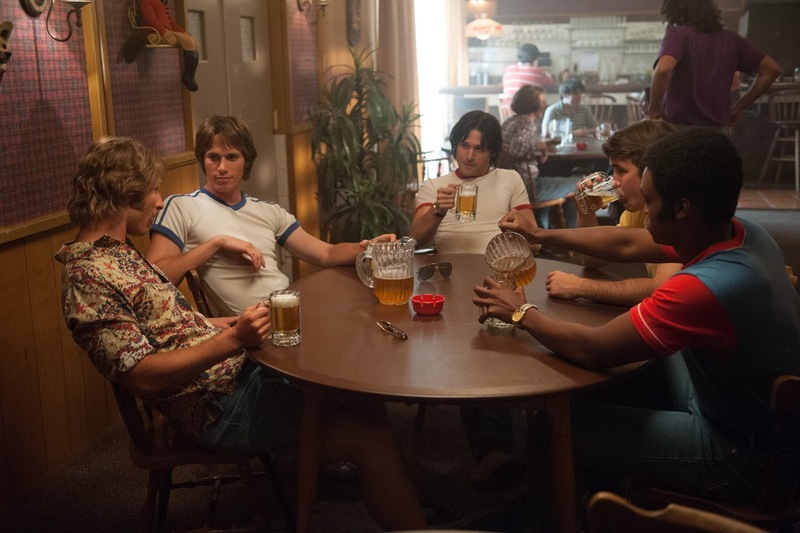 Much like Boyhood, Everybody Wants Some is pretty much faultless. To Summarise: With Richard Linklater's delicate script and confident direction, Everybody Wants Some depicts one simple but compelling theme in a beautiful, engaging way. 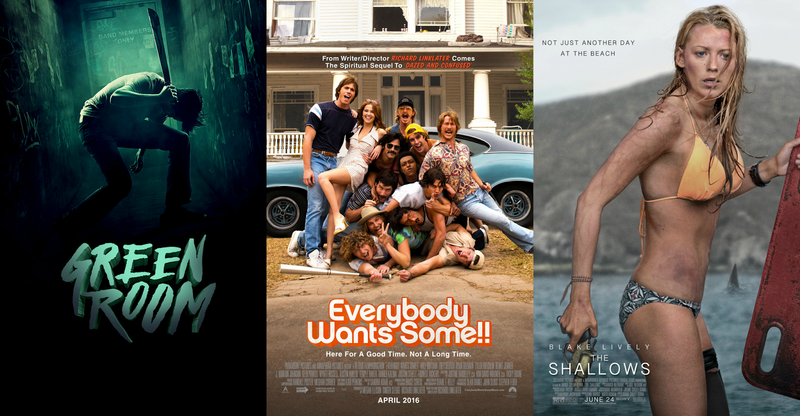 It's kind of handy to get to review The Shallows and Green Room in the same article because, in some ways, they're quite similar films. Both make use of a smaller cast, both rely on tension, and both are all about survival against something trying to kill you. While they may be similar in premise, they couldn't be more different in quality: The Shallows is a total mess. With its glossy colours and pop music soundtrack, it begins like an advert for surfboards and Sony phones. Then, once Nancy actually becomes stranded on the rock, the film leaps into a frenzy of blood and gore with her repairing her torn flesh using earrings as makeshift stitches, but it frames it all from a PG-13 angle. The film also refuses to commit to the idea of leaving Nancy fully isolated, and so it brings random people into the frame for a matter of minutes at a time before wiping them all out in exactly the same way. With its repetitive nature and total refusal to adhere to what could move a tacky narrative into a thrill-ridden tale of survival, The Shallows has no time for any lengthy period of tension. Almost none of it works. In the film's woefully repetitive middle act, though, there are frustrating flashes of something better. There's a breathtaking shot during the moment Nancy is first bitten; while underwater, she thrashes around in agony as the blue water slowly turns dark red. She also bonds with an injured seagull on her small rock, and Blake Lively (somehow strong despite the woeful script) completely sells Nancy's desperate talking to the animal in a bid for her sanity and to help remain calm in a dire situation. Even if it's framed in a tame way and acts as the film's only real source of tension, Nancy healing her wound with her jewellery remains a grisly moment. Flashes of inspiration aren't enough to save The Shallows, though, and the film ends up feeling tedious even at just 80 minutes long. Completely refusing to use its own inspired simplicity to its advantage, the film's script even brings in a deep family trauma for Nancy to work through, as well as the decision on whether or not she should return to medical school. What should be a fun but tense little feature turns into something that can't decide what it wants to be, and The Shallows ends up flailing between a handful of things that just don't gel together. To Summarise: Despite Blake Lively's best efforts, The Shallows' tonal imbalances and near total lack of tension never allow it to transcend its gimmicky story.